Waste collection specialist RE:Group has boosted its fleet with two unique trucks to simplify waste collection in the garage sector. The bespoke vehicles have been developed for one-stop collections of hazardous materials and will bring environmental benefits as well as enabling garages to dispose of waste easily and efficiently. The Hull-based company has developed the units over the last nine months, working with vehicle body designers, and is providing the service through its RE:Claim division. 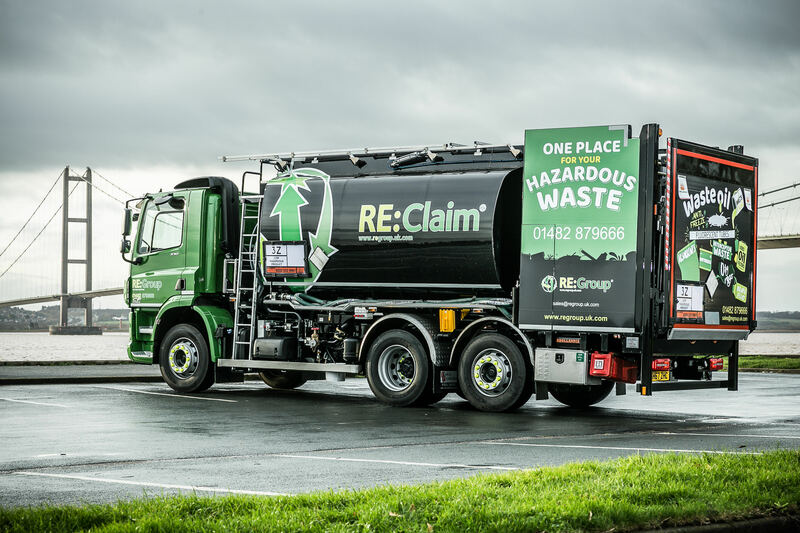 The vehicles, which carry the slogan One Place for Your Hazardous Waste, have been fitted with two-decker platforms at the rear of 15,000-litre capacity tankers, allowing the carriage of both liquid and solid waste streams. The firm is offering to collect waste oil in quantities from thousands of litres down to 20 litres, along with other hazardous waste, such as brake fluid, batteries, fluorescent lighting, antifreeze, oily rags, latex gloves and grease tubes. Re:Group managing director Paul Waine said one-stop collection was the future for the industry and would bring environmental benefits through reducing road miles as the result of making fewer journeys, as well as simplifying compliance with complex waste disposal tracking and reporting legislation. "While we have always made a point of ensuring liquid and solid waste collections are timely, we have often had to send two vehicles to a site to complete the job," he said. Mr Waine added: “We are providing one place for all hazardous waste and giving customers certainty that it will be dealt with safely and responsibly." The service is aimed at all garages, from large chains to one-person operations, and is first available to existing customers in the Yorkshire and Humber region, with the aim of expanding to other areas later this year. Oil waste undergoes a recovery process at RE:Claim's facility on the east bank of the River Hull. Ultimately, the materials are either recycled back to base oil for reuse or blended into a fuel to recover the energy value and displace the burning of fossil fuels. RE:Group also deals with waste from the marine and industrial sectors. It has UKAS accredited laboratories at its Air Street headquarters, provides a range of heating fuel for industry and employs more than 50 staff.